I am currently the Director of National Security Policy at the Center for Immigration Studies and a former counsel to the 9/11 Commission, where I co-authored the monograph 9/11 and Terrorist Travel alongside recommendations that appear in the 9/11 Final Report1. Prior to 9/11, I was counsel to the U.S. Senate Judiciary Subcommittee on Technology and Terrorism where I specialized in foreign terrorist activity in the United States and worked to pass the federal criminal and redress system in place today for identity theft. Today I focus on issues pertaining to border and identity security and its nexus to national security issues. In September I released an extensive report on E-Verify, and this past March a statistical analysis regarding current use of E-Verify. These two reports will be the focus of this testimony, alongside some basic facts in regard to how border issues affect national security. I have testified before the U.S. Congress ten times, and I am privileged to submit my testimony to the House Government Reform Subcommittee on Management today. Current federal law prohibits an employer from knowingly hiring an unauthorized alien. Employers who use the federal program E-Verify in good faith, however, are able to use enrollment in E-Verify as an affirmative defense against federal law enforcement action for the hiring of unauthorized workers. A rule simply requiring federal contractors to use E-Verify – considering their contracts are paid with taxpayer dollars and often have access to critical infrastructures—is simple common sense. Federal policies that encourage employers to sign-up and use E-Verify align federal responsibility for enforcing our immigration laws with a rising tide of state laws that require use of E-Verify under defined circumstances. E-Verify further enables the federal government to more closely determine bad actor employers who knowingly, and repeatedly, hire unauthorized workers. In a report I released in September 2008, If It's Fixed, Don't Break It: Moving Forward with E-Verify3, E-Verify was shown as 99.5 percent accurate with more than 1,000 employers voluntarily signing up per week. According to the most recent official study of the program by Westat, these numbers are steadily improving and E-Verify may to date be the most successful interior border program in place. On a broad basis, Congress needs to stand by E-Verify and not permit any aspect of E-Verify to be a bargaining chip for an otherwise already severely troubled immigration system. Congress must keep in mind that once more blindfolding employers from determining authorized from unauthorized workers is not in our national interest. Nor is increasing job insecurity for American workers or decreasing our ability to better secure our critical infrastructure worksites. E-Verify is fast, efficient, and inexpensive for employers to use and effective at rooting out fraud. Error rates have come down substantially and continue to drop, as the Social Security Administration (SSA) and U.S. Citizenship and Immigration Services (USCIS) streamline their matching and referrals. A great help are an increase in photos available with the Photo Screening Tool, further reducing the ability of job applicants to feign legal work status. Most interesting is that the percentage of those not authorized to work when vetted through E-Verify mirrors the percentage of illegal workers in the U.S. workforce, about 4 to 5 percent. E-Verify is supposed to return non-matches—that is where those not authorized to work will show up. Mixing those numbers in with the small fraction of those wrongly non-matched skews the discussion of E-Verify, and must be accounted for when “problems” with E-Verify are listed. While my September 2008 report holds many E-Verify details, some of the key facts on E-Verify follow. 94.2 percent of all E-Verify queries instantly verify as of 2007; as of the third quarter of 2008, 96.1 percent of employees are confirmed as work authorized before any type of mismatch notice or need for action by the employee or employer.5 As recently as May 2009, Department of Homeland Security Secretary Napolitano confirmed that recent surveys showed that the 96.1 percent of employees reported in my backgrounder If It’s Fixed, Don’t Break It, are still accurate. In FY 2007, E-Verify received about 3 million queries, 157,000 were found to be unauthorized to work despite having evaded the I-9 process previously, stopping their illegal employment. As discussed subsequently, these numbers have increased significantly in the past six months. Cost to employers, according to the 2007 E-Verify Westat report, is "$100 or less in initial set-up costs for the Web Basic Pilot (E-Verify) and a similar amount annually to operate the system." Enrolling in E-Verify and signing the E-Verify Memorandum of Understanding takes about 10 minutes and can be e-signed. As of February 2009, USCIS incorporated Department of State passport data in the E-Verify process to reduce mismatches among foreign-born citizens. However, an agreement garnered by Department of Homeland Security Secretary Chertoff with the Department of State to provide U.S. citizen passport photos, visa photos, and state-issued driver’s license photos in the system as well, has been abandoned by Secretary Napolitano. The photo-screening tool in E-Verify helps stop identity theft and counterfeit identities and currently applies to non-citizens who supply documents with DHS photos, which represents about 3.8 percent of all queries. Up from September 2008, twelve states now require use of E-Verify. Three states – Arizona, Mississippi and South Carolina – apply E-Verify to all employers in the state, public and private. Arizona’s law was challenged but upheld by the Ninth Circuit, leaving little to doubt of other states following Arizona’s lead in making E-Verify mandatory for all businesses. Nine other states – Colorado, Georgia, Idaho, Minnesota, Missouri, North Carolina, Oklahoma, Rhode Island, and Utah – apply E-Verify to those working in the public domain: state agencies, contractors, or subcontractors. Tennessee encourages use of E-Verify. US Citizenship and Immigration Services (USCIS) 2009 data up until July 4, 2009 show that E-Verify— if it stays static over the course of the remaining six months of 2009—will have grown at a rate of 274 percent since the program became fully electronic in 2007. 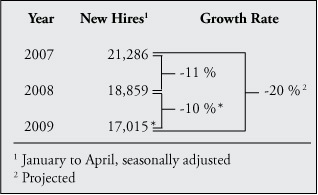 This is despite a 20 percent drop in new hires in the past two years. All told, current data shows that while in 2007 use of E-verify was at one in 19 new hires, in 2009 nearly 1 in 4 new hires are being vetted through E-Verify and are likely to be through the end of 2009. 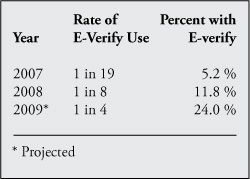 The 2009 projected growth rate for E-Verify use by employers is at least 274 percent. This projection is a significant decrease from our March 2009 analysis that projected a 442 percent increase in E-Verify use through the end of 2009. These numbers were based on the first seven weeks of 2009, and the 103 percent growth rate E-Verify had between 2007 and 2008. The drop-off in growth—while still a substantial drop in four months from March (442 percent projected growth to July 2009 (274 percent projected growth) -- is less likely to be caused by the economic downturn than political factors since the decrease in new hires is about the same for the past two years. Rather, immediately after publication of my March 8th, 2009 blog on the Center for Immigration Studies website, serious concerns mounted as to whether E-Verify would be re-authorized. E-Verify was then only reauthorized for six months at the last day of its statutory life. Concerns arose as to the extent of Congressional and administration commitment to the program. All the sudden, E-Verify’s future became uncertain. With rumors that E-Verify would be used by the Obama administration and Congressional Democratic leadership as a bargaining chip for an autumn 2009 amnesty bill, the value of signing up with E-Verify likely began to lose some of its sheen. Add to that a failure to implement the Executive Order mandating use of E-Verify for federal contracts and a solid backing away from worksite enforcement as pursued by Homeland Security Secretary Chertoff, and incentives for E-Verify use plummeted. However, despite the seemingly negative effect of Obama administration policy on E-Verify use, employers continue to find tremendous value in E-Verify across the board, as the E-verify queries surge despite the political environment. In short, while the Obama administration is tantalizing some employers with a notion that they may be off the hook and need not sign-up with E-Verify, many other businesses continue to note the value of E-Verify by signing up with the program. This trend is likely to continue, barring some serious shift in policy. 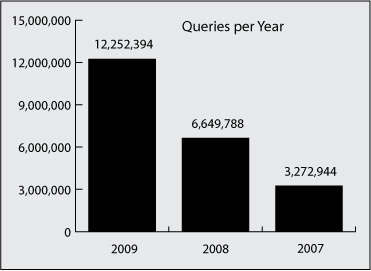 Online queries for 2009 were approaching 3 million in March 2009, almost half of the 6.6 million queries for all of 2008, a number that had more than doubled the 2007 use of E-Verify. Those numbers translate to E-Verify being queried in 2008 for one in eight new hires, or 13 percent of new hires. That was up from a one in 19 new hires being queried via E-Verify in 2007, or about 6 percent of new hires. 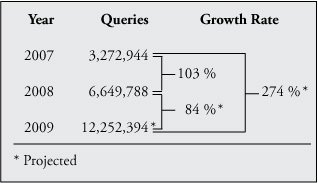 Those queries are now at about 6 million, nearly what they were for all of 2008, or one in four new hires. We project that if the numbers stay constant until the end of 2009, E-Verify will be queried about 12.2 million times. According to my September 2008 report, If It's Fixed, Don't Break It: Moving Forward with E-Verify, more than 96.1 percent of these queries will be automatically verified as employment authorized. E-Verify enables compliance with federal law cheaply, efficiently and accurately—about 4 to 5 percent (476,000 to 610,000) of the work force should receive tentative nonconfirmations according to Center for Immigration Studies estimates of an illegal work force. The fact that 488,000 or so individuals receive this nonconfirmation is not a red light on the program, but rather a showing that E-Verify is doing its job: accurately providing employers with work authorizations and nonconfirmations. The one weak point is a small problem with false positives, but that problem will be persistent as DHS will need to work hard to keep ahead of fraud—like it does with any program reliant on identity verification. the North American Industrial Classification System (NAICS code). On March 5, 2009, USCIS announced that passport data is now accessible for work authorization verification. The value added of passport data to E-Verify is that it will reduce incidences of mismatches for naturalized citizens who have not changed their status with the Social Security Administration (SSA). Work eligibility is now seamless for foreign-born citizens who previously would receive a mismatch from the initial E-Verify query with the SSA if they had become citizens but not informed the SSA. The glitch would occur because all new citizens must apply for a new Social Security number. Failing to do so, however, resulted in tentative nonconfirmation from E-Verify, which queries a check with SSA first. That problem is now superseded by USCIS immediately querying State Department passport and visa records prior to issuing a TNC. This resolves a program criticism by independent auditor Westat in a September 2007 evaluation that noted that foreign-born citizens were more likely to receive tentative nonconfirmations than U.S.-born citizens. Of note is that USCIS was already resolving this issue with a May 2008 enhancement, whereby USCIS could be directly queried by foreign-born citizens if they received a tentative nonconfirmation. That automation had reduced mismatches by 39 percent. However, adding State Department data will further streamline the authorization process, while also reducing the small amount of fraud that the most sophisticated of identity thieves are still able to use to bypass E-Verify and acquire false work authorizations. Fraud would be further reduced when USCIS is able to access the State Department’s original passport and visa application digital photos. Rollout was planned for autumn 2009, but has been postponed. No explanation has been provided. Despite the fact that E-Verify is arguably one of the best government programs in existence, it is still in real trouble. Partly perhaps, because of its success, forces not interested in streamlined work authorization—like the Chamber of Commerce—who have been fighting the program vociferously. If we undo the policies well on their way to fruition like the fully operational E-Verify, and find measures to discourage employers from using E-Verify or states from proactively seeking to use E-Verify to comply with federal immigration law, we will find that we have undone the progress towards a more transparent, legally authorized work force we have been sounding the alarm about desperately needing for years. Change in our pockets is what we need. Not change away from solid programs good for Americans. 1 See www.911securitysolutions.com, for consolidated information on 9/11 Commission border work.